Conjuring Tricks Which Puzzled The World. Fifty years ago today two young men from Cheltenham, John Nevil Maskelyne and George Cooke, presented for the first time to a West-end audience an entertainment they have been giving for several years in the province and at the Crystal Palace with Considerable success. It was intended that the London season should last a month, but the patronage of the public determined Maskelyne to extend it, and, as he could not remain at St. James’s Hall, he moved the entertainment across the street to a room in the Egyptian Hall, another of London’s lost landmarks, which, greatly daring, he secured for a three months tenancy, never dreaming that he was to perform there, afternoon and evening for over 30 years. At this time another room in the Egyptian Hall was occupied by Dr. Lynn, the talkative conjurer, and elderly Londoners still remember how a prospective patron was pulled about by the commissionaires for the rival shows who shouted in either ear “This way for Maskelyne and Cooke and the Floating Lady.” And “This way for Dr Lynn and another man cut up today.” Lynn’s competition soon ceased and Maskelyne reigned alone at the Egyptian Hall which he converted into a MECCA FOR LOVERS OF MYSTERY and made world-famous as England’s Home of Mystery. Here he produced those marvellous automata. Psycho, the whist player; Zoe the artist; Fanfare, the cornet player; and Labial, the trombonist; presented the long series of magical playlets which were always a feature of the Maskelyne and Cooke entertainment; and called to his assistance all that was best and newest in English and Continental conjuring. Maskelyne was fond of telling a story of these early years at the Egyptian Hall, which is interesting as showing not only how the fame of the entertainment spread to the outposts of the Empire, but as an example of the curious ideas a spectator carries away for a conjuring performance. Two Army officers once called upon him at the Hall and asked when he would be performing the trick of cutting off his own head and making it float round the hall, as they particularly wished to see it before they rejoined their regiment on the Indian Frontier. To Maskelyne’s reply that he had never performed such a feat, they said “Oh, you must have done; a gentleman in India told us that he saw you stand in the middle of the stage, cut off your own head, and make it float all round the hall, singing. Here comes the bogey man.” The truth was of course, that the spectator had confused the illusions he has seen, and had; perhaps unconsciously exaggerated a little. He has seen a trick in which Maskelyne apparently cut off Cooke’s head, who walked about the stage with it under his arm, and had mixed it up with the Floating Lady, or Floating Man, for Maskelyne himself often did the floating. Perhaps the best known of the many conjurers who appeared under Maskelyne’s management were the Frenchman Bustier de Kolta and Charles Bertram and David Devant, both Londoners. De Kolta has been regarded as the most ingenious and inventive conjurer yet seen in England, though David Devant runs him closely in that respect, and his illusions, “The Cocoon,” “The Vanishing Lady.” “Modern Black Magic,” and “The Expanding Die.” to mention a few only are still remembered by enthusiasts in conjuring. Charles Bertram , who WAS KNOW AS “THE ROYAL CONJURER” from the frequency with which he was summoned to entertain English and visiting Royalties , was pre-eminently a drawing-room performer, and did more than any man before him to popularise conjuring as a home recreation. The wonders of David Devant who happily is still with us, are known to audiences all over the country. 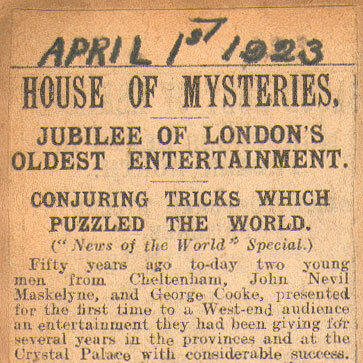 It was in 1893 that he made his first bow to an Egyptian Hall audience, and began his long association with the Maskelyne entertainment, in the course of which he rose to the forefront of the English exponents of the magic art, and presented a long succession of brilliant tricks and spectacular illusions. Cooke died early in 1904, and at the end of that year the owners of the Egyptian Hall which was nearly a century old, decided to pull it down. Maskelyne acquired a new home at St George’s Hall in Langham-place, long the scene of the German-Reed and other popular Victorian entertainments and remarkable coincidence of the Davenports performances in London, which had led Maskelyne to embark on his career as a showman. Maskelyne entirely rebuilt the hall and reopened it on January 2nd 1905 and from that day to this the entertainment has been successfully conducted there, at first by Maskelyne and Devant in partnership; after the latter’s withdrawal in 1915 by Maskelyne and his son Nevil; and since the veteran conjurer’s death in 1917, by Mr. Nevil Maskelyne, who is now assisted by his son, Captain Clive Maskelyne. bewildering display of magical novelties and some old favourites. The culminating point in the programmes was reached when Lord Knutsford on behalf of the Magic Circle, presented to Mr. Nevil Maskelyne a beautifully designed address and a magnificent silver bowl, as a token of the members personal esteem and in recognition of a 50 years run by London’s oldest entertainment.